In reading McGrath’s article, Using insights from teachers’ metaphors, I found some of the ideas described might be useful in helping me reflect on my own practice. The first is the relationship between attitude, belief and action. Oppenheim’s perspective on attitudes and beliefs describes how our personality determines our values, which in turn determine our attitudes, and these our opinions. Combining this with Fishbein’s ideas, I’d add a fifth step to the model to include actions. With this in mind I’m starting to consider how my practice is informed by my personality. I’ve started to put together some ideas and thoughts but in truth I haven’t really figured it out yet. 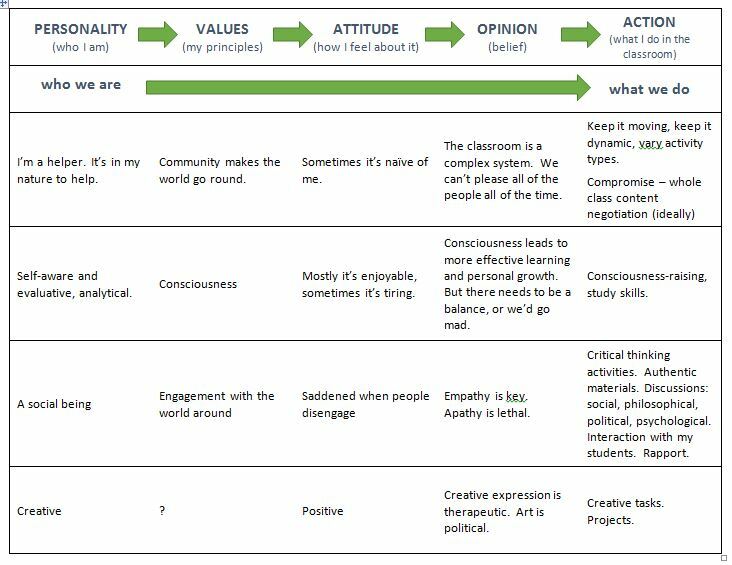 Perhaps some of these thoughts will become clearer but for the moment I’m trying to accept the lack of clarity – become a more ambiguity tolerant learner, as it were! My intention is not to take any action on this as such, but to let it settle somewhere in my mind and come back to it at a later date, to see whether I have any more clarity about these things, and how my thoughts might have developed.